Win a Date with Four of the Kapuso Heartthrobs Rocco, Dion, Sef, and Ruru! 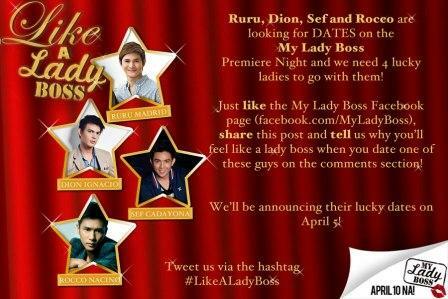 Kapuso heartthrobs Rocco Nacino, Dion Ignacio, Sef Cadayona and Ruru Madrid, who are part of the upcoming romance-comedy movie "My Lady Boss," are dangling an unusual invitation: they are looking for ladies who could be their date during the red carpet premiere of the movie happening on April 9 at SM Megamall. Interested ladies must like the official Facebook Fan page of "My Lady Boss" (http://www.facebook.com/MyLadyBoss) and share the highlighted post found on top of the page (featuring the four boys).